“Train up a child in the way he should go: and when he is old, he will not depart from it.” (Proverbs 22:6) is one of the most familiar verses in the Bible to those who are parents or work with children. But I think we sometimes take this simple little verse for granted and don’t pay it the respect that it should receive. There is a lot more to this verse than meets the eye. Upon it rests the future happiness and success of the recipient of the training and also the long life and joy of the trainer. This verse is a lot more important than what it may first appear. The wise parent will not pay it lip service. Teaching is very important, but it is not training. When I was in the service, we had a training schedule. During the course of the training schedule, we were taught a particular skill. After the lesson, we performed that skill. We did it over and over and over again until we mastered it. It was the performance that we call training. Teaching is conveying knowledge. Training is mastering that knowledge. It is one thing to be taught how to ride a bicycle; it is quite another to ride one. Teaching conveys the truth. Training masters that truth. Training is the “DO” in every lesson. Without doing, there really isn’t any learning. Jesus said, “Go, and do thou likewise.” (Luke 10:37) Children remember 10 percent of what they are told, 25 percent of what they are shown, but 65 percent of what they do. It just makes sense that if we want our children to learn, we will have them do something over and over again until they master that trait, skill, or truth. There is no training taking place without something being done. The fundamental law of teaching is that the person doing the work is the person doing the learning. Doing (training) is the finishing act of learning. 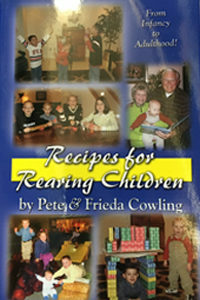 Recipes for Rearing Children by Pete & Frieda Cowling $12 on sale now! Click the picture for more information. Rules Are Not Training Up a Child. When parents make rules for their children and enforce those rules, they are not training their children. For sure, the rules are necessary. But they are only a stop-gap measure until training is successfully implemented. When the training is complete, then the child will be self-disciplined and will be obedient to the commandments of God on his own accord. Children must be trained, not controlled. Every June, we see young people who have submitted themselves to their parents’ rules all of their life. They graduate from high school, throw off the shackle of those rules, and do their own thing. Why? Because they have never been trained. They obeyed the rules, but they never mastered the truth behind them. Christian Schools Do Not Train Children. To be sure, training takes place in the Christian school. The Christian schools are a tremendous help to the parents. But that is all they are, a help. It is parents who “train up a child.” No school, no matter how good it is can take the place of a godly Mom and Dad training their child. The Christian school was never intended to replace the parents and their obligations. It is only an aid in the training process. It is very time consuming to train your children. That is one reason why so few parents bother to train their kids. It is not an easy task. It is far easier to assume that the church, the Sunday school, the youth pastor, or the Christian school is going to take care of it for you. For instance, training a child to work means that someone is going to have to spend many hours working with that child. It means that father and son are going to share work together. It is not nearly as much fun as going to a ball park and watching your favorite team play while you eat a hot dog and drink a soda. Many mothers would rather clean the house themselves than try to get their teenage daughter to help clean. 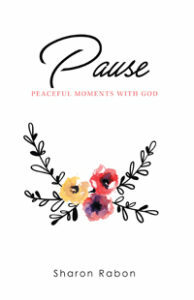 Pause: Peaceful Moments with God $10 a sixty-day devotional written to help women set aside time each day to pause and spend a peaceful moment with God. 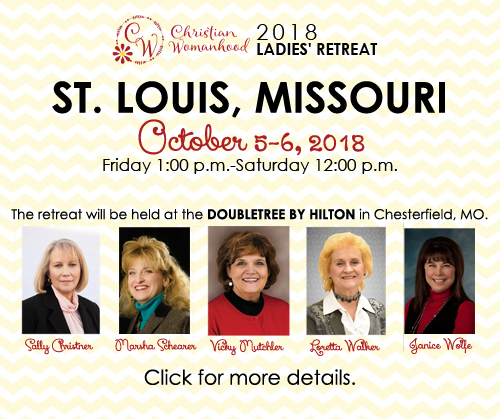 Click the picture for more information. The time spent training your children will become precious memories for both you and your children. When your children are grown, it will be the training sessions about which they will talk. They will tell your grandchildren about the times they spent with you learning how to work. I encourage you to spend time with your children training them.